TONY O’BRIEN HAS stepped down as HSE Director General amid the scandal over a failure to communicate the findings of scans to women diagnosed with cervical cancer. In a statement this evening, O’Brien said he has made his decision to avoid any further impact to the delivery of health and social care services, “and in particular the cancer screening services that have become the focus of intense political debate in recent days”. 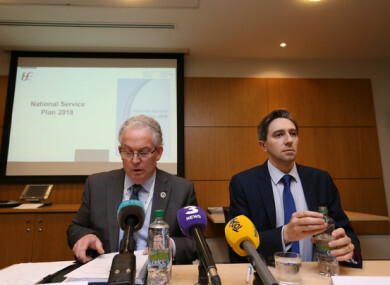 In a statement, Minister for Health Simon Harris said he wanted to thank O’Brien for his “many years of service and dedication”. He said: “I know that he is standing down from his role today because he believes it is in the best interest of rebuilding public confidence in the wake of the issues which have arisen in CervicalCheck. Tomorrow the Cabinet meeting will again discuss this matter and the further measures which can be put in place to care for and support the women and families affected. O’Brien had been Director General of the health service since July 2013 and had already been due to leave his role at the beginning of July. Pressure had been mounting on O’Brien over the course of the day, after a memo released to the Public Accounts Committee shows that HSE management was warned back in 2016 that there could be negative media coverage about the CervicalCheck audit. The briefing note from July 2016, which was seen by Tony O’Brien, said that “all international screening programmes will have encountered a media headline that ‘screening did not diagnose my cancer’”. It said that the CervicalCheck programme was prepared for such media coverage. O’Brien told the Public Accounts Committee this morning that the message did not “ring alarm bells”. Emma Mhic Mhathúna, a mother of five children, spoke on RTE’s Morning Ireland earlier today about how a delayed cervical cancer diagnoses was uncovered in a recent review by the HSE. She was told this week that her cancer has returned and is terminal. She said her family is devastated by the news. The CervicalCheck scandal came into the public eye last month when Vicky Phelan, whose cervical cancer is also terminal, settled a High Court action against the HSE and Clinical Pathology Laboratories for €2.5 million over incorrect smear test results from 2011. More information has continued to emerge about the controversy whereby women were told that they had normal smear test results in error. It has since emerged that more than 1,500 women who developed cervical cancer did not have their cases reviewed by CervicalCheck. Email “Tony O'Brien has stepped down as HSE Director amid cervical cancer scandal”. Feedback on “Tony O'Brien has stepped down as HSE Director amid cervical cancer scandal”.